Varicella (chickenpox): Personnel must provide documentation of receiving two doses of Varicella vaccine at least four weeks apart or physician diagnosis or personal recall of Varicella disease or proof of immunity. STUDENT TEACHER OR COUNSELOR INTERNSHIP INFORMATION: For individuals interested in doing their student teaching, administrative or counselor internship through the Murray City School District, please complete the attached application and return to Darren Dean, Director of Personnel & Student Services. 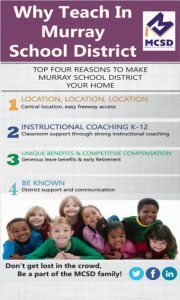 It is the policy of the Murray City School District to provide and promote equal opportunity employment compensation and other terms and conditions of employment without discrimination because of race, color, gender, religion, national origin age, disability, pregnancy, childbirth, sexual orientation, or gender identity. The District provides reasonable accommodation to the known disabilities of employees in compliance with the Americans with Disability Act.